“My sophomores know I care about what I do, and I actually teach my hear out,” says Ms. Berrios. She’s not just any regular alumna; she also made it to the Miami Senior High School Hall of Fame in 2008. Her name is Isamara Massiell Berrios, who just recently graduated with a master’s degree from FIU. She loves to teach, not just because it’s her job, but because she wants her kids to have a bright future. She really cares about them learning new things. Believing her teaching methods are great, Ms. Berrios likes to keep students engaged, make learning relevant and more hands on. 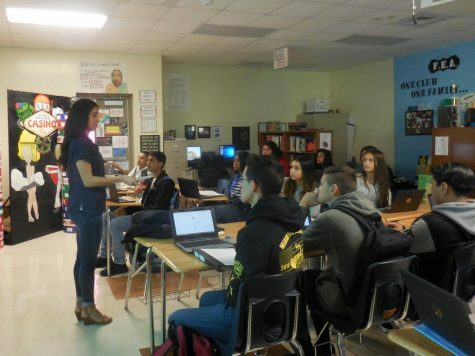 Ms. Berrios teaches English to sophomores, but she didn’t specifically choose that assignment. The administrators thought that’s where she should be. There’s a lot of pressure for Ms. Berrios teaching 10th graders because of the FSA, but she loves to read Macbeth with her students. “My sophomores know I care about what I do, and I teach my heart out,” she said. Also directing the teaching magnet, Ms. Berrios’s job is to recruit students, promote the program, train leaders, and manage behavior. The teaching magnet has two strands, elementary and secondary. “You can get your CDA through our early childhood program or learn more about teaching older kids and explore different careers within the secondary strand,” said Ms. Berrios. Also, the teaching magnet allows kids from all over Miami be able to attend Miami High even though it’s not their home school. Students should join the magnet program to explore different careers within the education field. 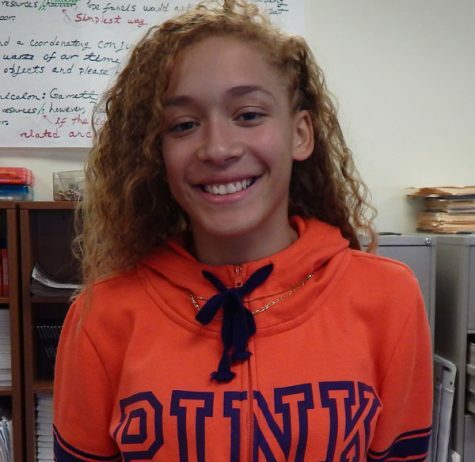 Ms. Berrios said, “We admit a little over 100 students each year.” To get in the teaching magnet, all you need is good grades, conduct, and attendance. You can apply online. Ms. Berrios is not only a teacher, but the advisor for Future Educators of America. When she was a student in Miami High, she was in FEA as an officer. Her position was recording secretary. What brought her into being an advisor for FEA she said, “It’s a wonderful way to give back to my colleagues, as in Teacher Appreciation Week.” She loves to see how much joy the club can spread. FEA is all about promoting the teaching profession and giving back to teachers at Miami High. “FEA members get to give back to the community, compete in homecoming, plan Teacher Appreciation Week, vote for Teacher of the Month and Year,” she said. There are 30 members and 9 officers, and it’s just getting bigger. Some trips FEA takes are to Orlando for state conference and FIU for regional conference. FEA placed 3rd place for the homecoming parade in 2017. They were the first small club, not only to do a float, but to be able to place that high. Ms. Berrios said, “It felt unbelievable, surreal. It was a rush of emotion, seeing what the students put into it and getting excited.” That moment brought FEA together and closer than ever. Brazil and Peru are some recent places Ms. Berrios traveled to over the summer. She loves to travel to unfamiliar places every time. She believes it’s great for the soul and mind. Ms. Berrios does not travel alone though. Some other places she has traveled with her friends and family have been Jamaica, Italy, France, Puerto Rico, and Dominican Republic. During the breaks she has, she tends to use that time to travel. Her favorite places to visit are the Caribbean, Europe, and South America. “Argentina and Spain are the next places I would love to visit,” she said. “GOOOO, GATORS!” is Ms. Berrios’s favorite saying. Not only is she a Miami High alumna, but a University of Florida graduate as well. Ms. Berrios was offered a full ride scholarship to UF which, is the #1 university in the state of Florida and one of top in the nation. “Get a free education from a great school, why not?” she said. Not only did she hit the books and study, but she believed in balance. She had time to have fun, but also time to be a great student. “UF was the #1 party school in the nation when I was there, and they had a lot of Greek parties,” Ms. Berrios said. She had many accomplishments at the University of Florida. Ms. Berrios was in Gamma Eta Sorority, Hall of Fame for UF, and the President for the Greek Council, which were all a big deal for her. One fun memory was “pledging for my sorority and being the new member educator.” Another of her best moments in college was going to Jacksonville for the Florida vs Georgia game with her sorority. Ms. Berrios graduated from Miami High in 2008 near the top of her class, more specifically #3. She got into BETA freshman year and became BETA president for 2 years. She joined BETA because of club sponsor Dr. Hueck. “He saw something special in me. Nicaraguan like me, he was a role model to look up to,” she said. According to Ms. Berrios, BETA was always popular and had diverse students such as football players, cheerleaders, scholars, and leaders. She was also involved in Science Honors, Historical Honors, Class Secretary, Mu Alpha Theta, Hall of Fame, and wrestling manager. Some teachers Ms. Berrios had and still talks to now are Dr. Hueck, Ms. Puentes, who was teaching her AP Lit, and Mr. Valdes who was her assistant principal. Ms. Berrios came back to teach at Miami High because she believes in giving back to her community. Although she had already signed her contract to teach in Mater Academy in West Hialeah, she got out of it to teach back in her home school. Once a Stingaree, Always a Stingaree.